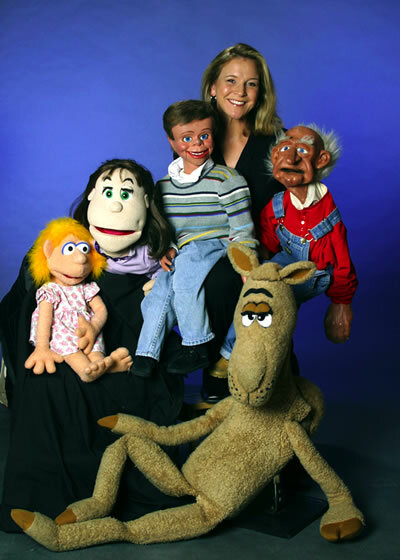 Lynn Trefzger is a ventriloquist/comedienne with a trunk full of zany characters that have accompanied her to stages throughout the country. Named the 2006 Funniest Female Performer of the Year, by CAMPUS ACTIVITIES MAGAZINE and nominated 2007 Funniest Female by American Entertainment Magazine. Her off-the-wall audience interplay is riotously funny, and her performances are tailored for both family and adult audiences. Lynn (and her many voices) has appeared on ABC, TNN, A&E and Lifetime television. STARRING IN "I'm NO DUMMY"
Named the 2006 Funniest Female Performer of the Year, by CAMPUS ACTIVITIES MAGAZINE, as the result of votes by thousands of college students nationwide! Nominated 2007 Funniest Female by American Entertainment Magazine. Her vocal illusion talents were first brought to national audiences on TV’s popular “Star Search” and she has since performed with artists including Jeff Foxworthy, Ray Romano, Drew Carey, and Faith Hill. Her off-the-wall audience interplay is riotously funny, and her performances are tailored for both family and adult audiences. Lynn (and her many voices) has appeared on ABC, TNN, A&E and Lifetime television. Fact: Your voice is not necessarily your own when you’re in an audience for Lynn Trefzger’s show. You could find yourself next to a rather inebriated camel -- or with a new baby you didn’t even realize you had. Warning: Be extra nice to her old man Judd… he can get quite cranky and forthright. He’s a cantankerous old man and he holds little back. "The feedback from retreat participants was overwhelmingly positive. The quality of our event was most assuredly enhanced by Ms. Trefzger's talent which made us laugh, cry (as a result of the laughter), and enjoy some all too rare and precious stress-free moments in time."